Our restaurant supply superstore carries many different Honey Mustard salad dressings from Heinz, Kraft Nabisco, Ach Foods and more. This is not only used for salads, but for dipping chicken wings and chicken fingers in as well. Honey mustard is great for chicken and other meats to dip in. Kraft Signature Dressing Honey Dijonnaise - 1 Gal. Kraft Honey Dijon Sauce Plastic Cup - 1 Oz. Texas Pete Honey Mustard Sauce - 12 oz. Honey Mustard Sauce Cup - 1 Oz. Low Sodium Honey Mustard Cup - 1 Oz. 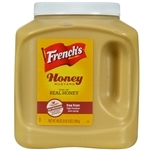 Honey Mustard - 12 Oz. Honey Mustard Dressing - 1 Oz. Hidden Valley Golden Honey Mustard Dressing - 1.5 Oz. 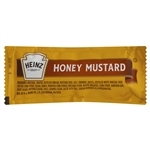 Honey Mustard Flavor Label Savory - 1.25 in. x 2 in. Fresh Dressing-Naturally Honey Mustard - 1.5 fl. Oz. Honey Mustard Pour Bottle - 2.18 lb. Hellmann's Condiment Classics Honey Mustard Dip Cup - 1.5 oz. Restaurant Honey Mustard Dressing and dip is great for salad bars and buffalo wing joints. It is great for chicken and other meats to dip in, or you can use it on healthy salads.